This is plate 5 from William Hodges' book 'Select Views in India'. 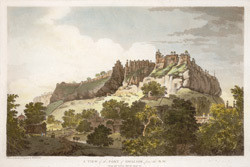 Hodges went to Gwalior during his third tour of India in 1783. Gwalior was renowned for its huge fortress with its impressive line of battlements and formidable bastions, built on a narrow and long rocky hill of sandstone. Due to its position, the fortress had been considered impregnable, until in 1780 a small group of British soldiers, guided by Major Popham, scaled the walls during the night and captured it.